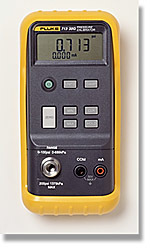 Fluke Model 171 of the Fluke 710 Series Pressure Calibrators. The Fluke 710 Series Process Calibrators offer a clear new choice in single-function calibrators. These hand-held calibrators deliver outstanding performance, durability and reliability. Just a note: The 717 Series Pressure Calibrator has an 1/8" NPT pressure port for pressure input. An external pressure source would be required for a complete pressure calibration setup. The 718 Series Pressure Calibrator has a built-in pressure Pump as well as an 1/8" pressure input port. Pressure Calibrator. Calibrator includes: C81Y Protective Yellow Holster with Flex-StandTM, Test Leads and Alligator Clips, single 9V alkaline battery, Instructions Sheet (14 languages).